Easiest business anniversary tip ever: Have the basics in place on January 1 of your anniversary year. Your website should splash at least one reference to the anniversary, even if campaign details haven’t rolled out. Lure and entice us, your readers and viewers. Borrow what you’ve done for Twitter as a placeholder, if needed. Example: Wegman’s, the wonderful grocery chain that remains family-run as it enters its 100th year, has a beautiful centennial Twitter banner shown above. I figure the guy in the suit is a founder. I trotted to wegmans.com to learn more, but was surprised to come up empty on this seminal anniversary. 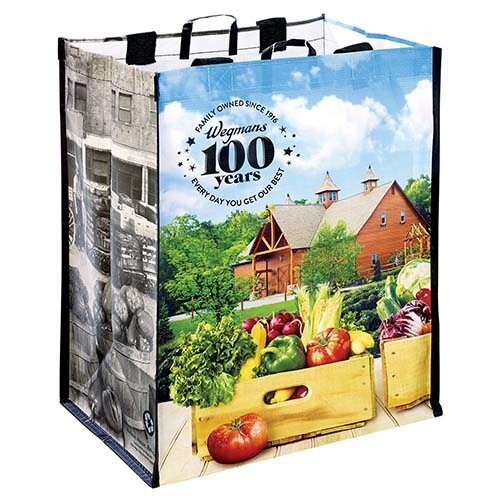 Had to drill down to find the general history, and when I entered “anniversary” in the search box, only the 100th anniversary bag came up (shown below). It’s cool! Would make a great teaser on the home page! No doubt much more is coming. But the moral of the story, business history style, is pretty simple: Movies have coming attractions and your big business anniversary should too.